Shopping Malls and airports have wide-open spaces in common, so we have coupled them together on this page. They are great locations for Wells, especially if you can place a Well in one of the primary foot-traffic patterns. The following information is specifically for malls since they are the most likely locations. If you are interested in placing Wells in airports, you can adapt this information as needed. Sometimes Wells are placed by tenants within the Mall, and they have permission to move their Well out into the traffic pattern during open hours. Other times, a charity will get permission to place a Well in the local mall. Sometimes the mall management will place Wells and encourage people to toss coins into it rather than a nearby water fountain. 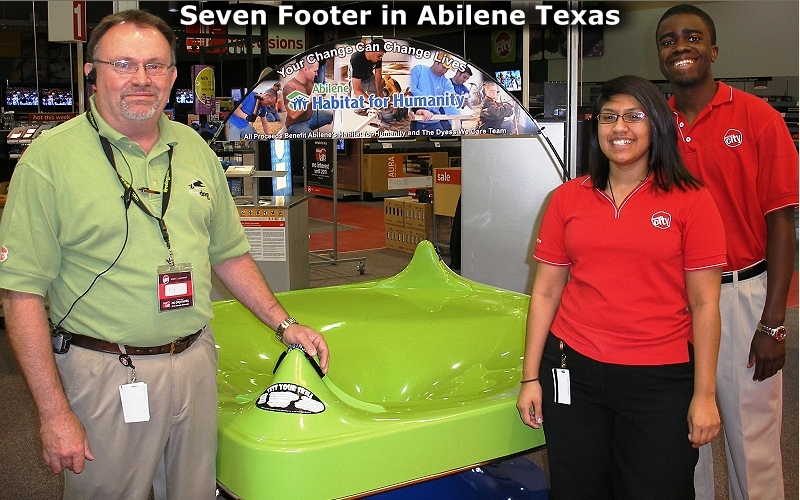 We designed our Seven-Footer for shopping malls and other large floor-space locations. With 8 coin launch ramps and an impressing visual impact, it can raise enormous amounts of money. As people use it and express their enjoyment, others are attracted to it, and it can easily have a steady stream of participants and observers throughout the day. In years past, our Wells were smaller, about 5 feet in diameter with 2 or 3 launch ramps. We have pictures of some of those here. The new Seven-Footer is so much more profitable that it can quickly generate enough money to completely pay for it, and still raise more money in that same year than the entire income of the older models. So upgrading is an easy decision. If you are a tenant or if you are the mall management, the steps are easy. You would just purchase a Well and place it. But if you are a charity or other organization and want to place a Well in a nearby shopping mall, we offer the following information and strategy to help you successfully place it. All malls rent/lease floor space to stores or kiosk vendors. Floor space is their product. They have rates for all their spaces, usually based on the square footage and the location. You can approach them as if you are a vendor wanting to lease space. But if you are a non-profit organization, there is a better way. Malls also do their own advertising, and they spend money on events and features that attract people to the mall. One of their biggest challenges is entertaining children. If children are bored, their parents take them home. So anything that attracts children or keeps them entertained is something that malls value. That’s what a Spiral Wishing Well does, so that is the best approach to the mall. It is best if you can carry a Well in when offering to place it, but that isn’t practical for most people with a Seven-Footer in a mall because of their size. Still, if you can do that, you can take advantage of what we call “The Warm Puppy Approach”. Without asking for a commitment, you can offer, “…to leave it here for a couple of weeks so you can see how much fun it is for children and parents.” After two weeks of observation, they won’t let you take it out. But, if you can’t offer it like that, you should equip yourself with other tools including one of the Mini-Well Vortx® Toys so you can demonstrate the attraction, along with pictures of Seven-Footers and a way to play the YouTube videos. We don’t recommend calling to set up an appointment ahead of time because that leads you down a path of having to try to explain your offer over the phone. It is better to walk into the mall’s management office without an appointment and asking to speak to the person who is most responsible for entertaining children at the mall. If that person isn’t available, you can then set up an appointment. But more than likely, someone will be there who will give you some time to make your offer. My name is ___________. I work with [name of organization]. We have a Spiral Wishing Well we’d like to offer to the Mall. You’ve probably seen them. [show them a printed color picture or two, or your media screen]. I also have a YouTube video if you haven’t seen the large Well in person. 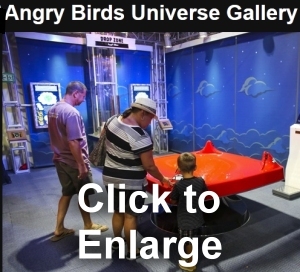 These are great attractions for children and offer their parents a chance to sit down and relax for a few minutes. I would like to offer to place our Well in the mall at no cost to you. Our costs will be offset by the coins that are tossed in. We will maintain and clean the Well, so it won’t add any responsibility to your staff. How does that sound? The rest of the conversation will depend on their response. If they agree, great. It is then only a matter of deciding where it can be placed. If they have flexibility, we suggest that you place it near a store that attracts children. You can suggest that because that also helps fulfill the purpose of attracting children. Try to avoid placing it in a side-hall where very few people pass by. One of the main thoroughfares is best. Better yet, if they will let you place one in each of their main halls, that is the best way to get coverage and generate the most revenue. 1) You can offer to give them 10% of the revenue for the floor space. If they tell you that their standard rate is 40% of 50%, remind them that this is providing something more valuable than revenue for the mall…an attraction for children that they normally spend money to achieve. 2) If 10% isn’t enough to motivate them, you can always increase it. 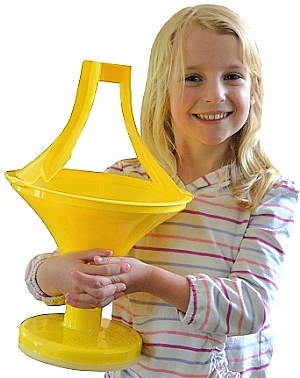 Even if you have to give them 50%, it will still be profitable, especially if you are also selling the Mini-Well Toys at the same time (discussed below). 3) If they don’t readily accept, you can offer to place it for a couple of weeks so they can observe their patron’s responses. 4) In lieu of splitting coin-revenue with them, offer to let them sell advertising on the Well. A Spiral Wishing Well is a great venue for advertising because people spend a lot of time standing in front of it, and they are having fun at the same time. Since the revenue is for charity, the advertiser can think of it as a “sponsorship” which positions them as being supportive of community services. In other words, “This Well Sponsored by XYZ” can be worth a lot more than a commercial advertisement. If the mall doesn’t want to sell advertising on it, then you can find a sponsor yourself and that revenue will be yours. 5) Here is another creative option. 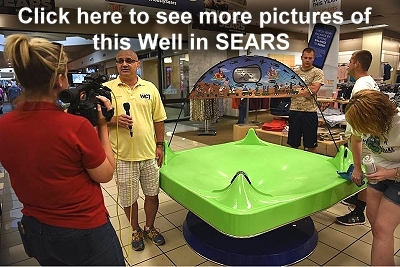 You can suggest the following to the mall: “Here is an idea. You could set the floor space cost at the full lease rate for this amount of space, and then write that off as a donation or advertising. That will provide a tax benefit that can be worth more than revenue splits. If you would like to have a smaller version of this Well at your fund raising event, please call or text [your phone number]. Click here to see more about rental options and the ready-made rental tools that you can use to make this an easy process. This is free money that is already on the table. You might as well take it! Would it be OK with you if I send a lot more people into your store? We have mini-wishing well toys, and if you will handle the transaction for us, we’ll give you a couple dollars for the transaction fees, and you can hopefully sell some of your products to the same people that would otherwise walk right past your store. The rest of the arrangement is the logistics. You would supply them with a case of the toys and instruct them as to the sale price. Basically, they are selling a product “on consignment” meaning, you supply the toy at your cost, and they then pay you an agreed-upon amount per toy. Presuming they sell them for the suggested retail of $24.95, and if you give them $2 to cover their transaction fees, they would then pay you $22.95. But to make it really motivating for them, why not set their fee at $20 so they can make a profit in addition to getting more customers in their store! Your cost is $12.50 to $15 each, depending on your floor model size, so you have plenty of profit margin without any effort. One of the questions that comes up is whether or not to ask the mall for a guaranteed period of time to keep the Well there. We caution against that. While it would be nice to be able to count on it for a long term, if you ask for it, that requires them to decide ahead of time whether or not they like it. How can they know that? It will slow down their decision process as they will probably have to take the decision to a committee, or ask their supervisors or owners who probably live in another city. It is better to let them fall in love with it based on their observations. So we don’t recommend that you ask them for a term. Rather, trust that the attraction will motivate them to always want it. There are many Wells that have been in Malls for 20+ years. But no business would ever sign a 20 year lease for such a device. A clean Well raises more money. Windex and a paper towel is all you need. We recommend that you clean it at the same time as you remove the money. If you have a very profitable location, you should remove the money more often. But at the least, we recommend once a week. Seven-Footers weigh about 200 pounds, so they are very stable and don’t need additional anchoring security. Some people put bags of sand or gravel inside the base, but it really isn’t needed. The coin-access door is locked (we include 2 keys with your Well). To prevent unwanted attempts to get to the coins, we recommend you remove the money regularly…don’t let large amounts build up inside the Well. The lock and key provides what is considered “light security”. It isn’t like a locked safe. So in addition to removing the coins regularly, we recommend taping a little note above the door that can’t be seen unless someone is on their knees looking under the Well that says, “The money in this Well is removed regularly. Please don’t damage our Well trying to pry open the door. It won’t be worth the effort, and you will be prosecuted.” That might seem a little silly, but would-be thieves always look under the Well near the door if they are thinking about taking the risks of stealing the money. A little sign-card like that will help convince them not to take that risk. Plus, there is usually camera surveillance that covers all areas of a mall. There is more information about security and other logistics here. 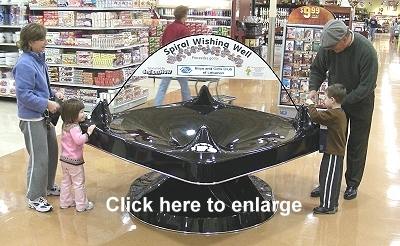 If you have additional questions about Spiral Wishing Wells in Malls or Airports, please don’t hesitate to ask.